When it comes to the solid array of interior features in the Fort Taurus, tremendous focus is maintained on style and comfort. The Ford Taurus comes with an array of interior features that set the car apart from the competition. One of the outstanding Ford Taurus interior features is a 12-speaker Sony sound system. The sound system is designed with Clear Phase technology that ensures static-free reception and a consistently crisp sound. In addition, the interior features of the Ford Taurus include an outstanding ambient lighting system. The system perfectly illuminates the footwells, the door handles, and the front cupholders. The ambient lighting system provides a selection of color options from two shades of blue to green to red to purple. 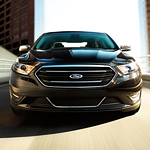 If you would like to take a look at the Ford Taurus up close, visit our showroom at Candy Ford. We are located conveniently in Charlotte and have a highly experienced team.